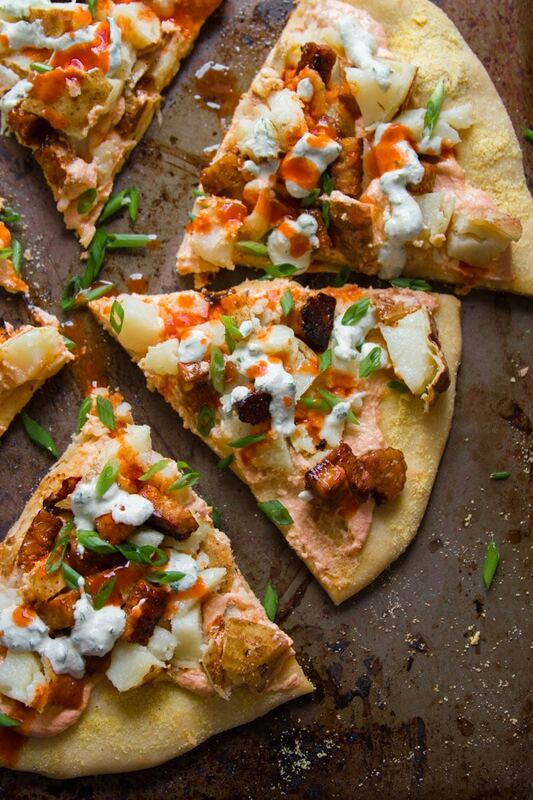 Pizza crust is slathered with creamy cashew Buffalo sauce then topped with smoky tempeh bacon, baked potato chunks, and dairy-free ranch to make this decadent vegan baked potato pizza. Let me just say that I completely recognize how ridiculous this pizza is. In fact, I really didn’t even think I was going to post it. As I was making it, I became pretty sure I wasn’t going to post it. It’s a bit of work for a pizza. And then it’s got the whole carb on carb thing going on. So do we really need such a thing as a vegan baked potato pizza in our lives"
That was the final verdict after I actually sat down and ate a slice for dinner. My husband started digging into his slice before I even got to mine and his reaction tipped me off that maybe the whole super-carb pizza thing might just be worth it. Guys, it was really, really good. And the Super Bowl just happens to be a perfect occasion for indulging in not only pizza, not only Buffalo sauce, but way carbed out pizza with Buffalo sauce. Let’s talk about how this one is put together! Instead of cheese or sour cream like you might find in a non-vegan baked potato pizza, I whipped up a batch of super simple cashew cream. Then I split it up. Most of the batch gets seasoned with Buffalo sauce and slathered on top of the crust. The rest is mixed with chives and parsley to make a dairy free ranch, which goes on top of everything.